Manchester City’s Stadium has revealed new and updated features of its tour, which is suitable for schools. 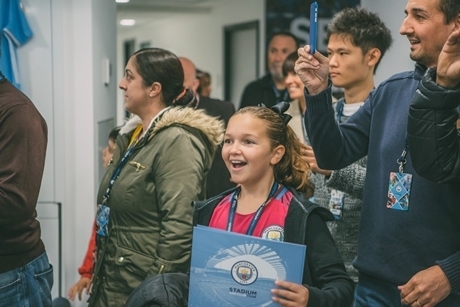 Schools can now experience a day out at the Etihad Stadium, as Manchester City Football Club unveils its revamped Stadium and Club tour, complete with exciting new experiences and facilities, ideal for groups of all sizes. Schools will enjoy the Club’s access-all-areas tour, where they will walk in the footsteps of their favourite players and explore brand new areas of the Stadium, including new, state-of-the-art player facilities and hospitality offering: The Tunnel Club, described as ‘one of the most immersive hospitality experiences in world-football’ and an area that will bring fans closer to the players than ever before. Classes attending the tour will be welcomed into the recently upgraded First Team changing rooms, where quotes from Tony Walsh’s poetic tribute to Manchester, “This is the Place” have been immortalised across the walls. Alongside this, the First Team warm-up areas, the away team facilities and the players’ tunnel have also been transformed and can be explored. The updated Stadium and Club tour gives pupils the chance to experience Manchester City’s heritage through memorabilia and interactive displays, enabling them to relive the teams greatest moment and discover exactly what makes Manchester City the club it is today. Manchester City’s Stadium & Club Tour is a guided tour of the Club and Etihad Stadium. A school visit can tie is with Physical Education, Business Studies, and History. The tours are suitable for all Key Stages. School rates are available too and presentations after tours can also be arranged for an extra cost. Presentation topics include Urban Regeneration, Sports Science and Business Studies. For more information, visit mancity.com/tours.